So after rebasing my Ogryns I moved on (in no particular order except they were next in the box) to my Ratlings. You'll notice as I work through these units that a lot of my models are very old. I'm not sure exactly how old these chaps are, but they're certainly no spring chickens. Wait till you see some of the stuff I've got in this force in later posts! To deal with these I kept the original bases as the textured sand that's on them is useful to the new scheme. I used a Dremel-type grinding tool to grind the green paint off the bevelled edge and brush-painted the base black before drybrushing white then adding snow, scatter, ballast and static grass. Well I've sidetracked myself. Again. I was well on the path to renovating and adding to my Sentinels by creating a Sentinel Platoon. I had everything assembled, undercoated (black) and had applied a load of masking tape ready to spray a layer of grey over the majority of the models, when I discovered my grey rattlecan was empty. So I set about deciding what else I needed to do. Big list. Don't get me started. What did I want to do? Well, since I'm working in my Imperial Guard, let's address a bugbear. I HATE the bases on my Imperial Guard. When I did my Valkyrie a while back I drew a line in the sand and decided that I was going to base them the same was as I had done for my Beastmen, Epic Chaos and (more recently) Tau. At some point I hope to be able to build a gaming table so want to establish a consistent look for all my models so they will fit in. So I figured I'd start with my Ogryns, as apart from the bases being the wrong colour, they were on 40mm square bases and I wanted to move to 40mm round. 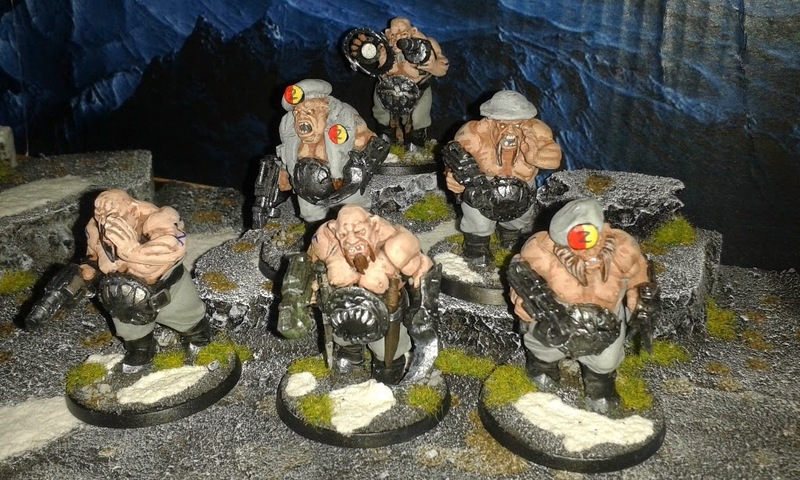 You've no doubt noticed that my Ogryns aren't Ogryns at all - they're converted WFB Ogres. Purely by accident - when I bought the first three of them from ebay a few years ago I wasn't paying enough attention. I liked what came in the post and worked with it. 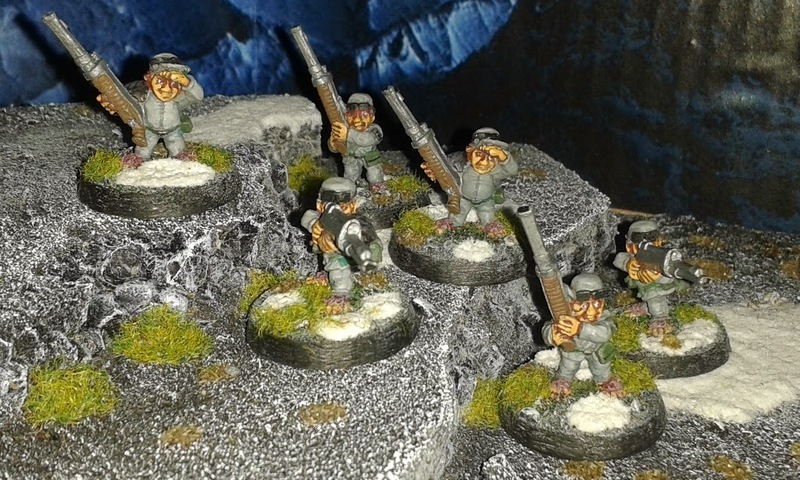 Then I decided to add three more so picked up some more Ogres and started playing with Milliput - the result is the models with the berets, tin-helmet and flak jacket. I'm taking a break from building my Tau army to work on something I've wanted to do for ages - a full Sentinel Platoon. I'm fully aware of the problems of Sentinels on the battlefield - they're slow (for a fast-attack option! ), fragile, BS3 etc. However, I've always love the aesthetic and have wanted to be able to deploy a full platoon ever since I first got the Apocalypse book. The idea of 10 Sentinels striding across the table (for however short a period they may survive) sounds ace to me. 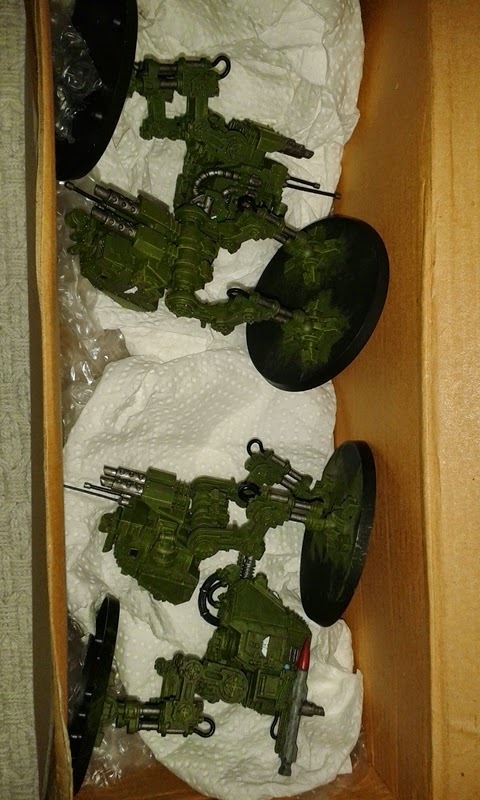 For my Imperial Guard I omly had two Scout Sentinel models, and they were in a bit of a scrotty state (and after my last hastily-packed-away trip to Warhammer World - both broken). So about a year ago when this whim last seized me I set about trawling ebay for Sentinel junk lots. 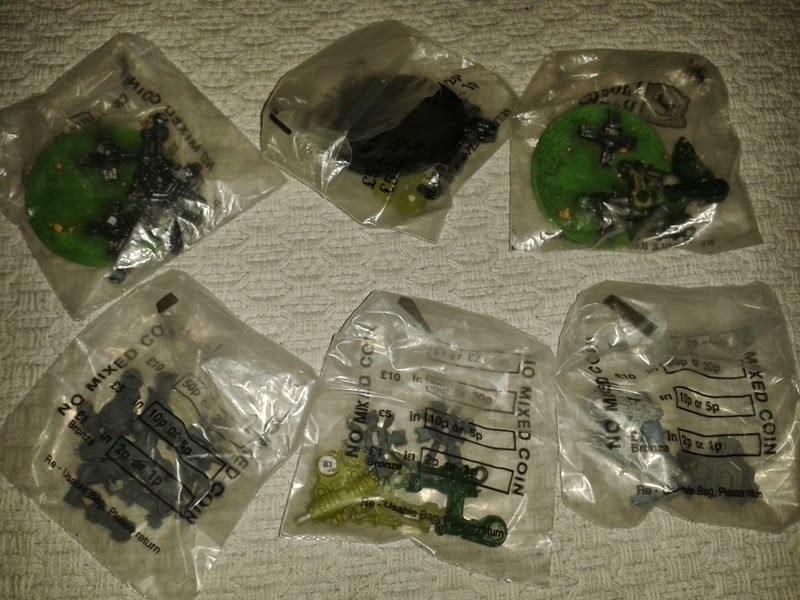 I did quite well, picking up 6 scout models in a single auction for under £15, including shipping. They were all in a similar state to my own models - broken at the ankles, weapons snapped off and the cagey-bit around the drivers damaged. That brought me up to 8 models. 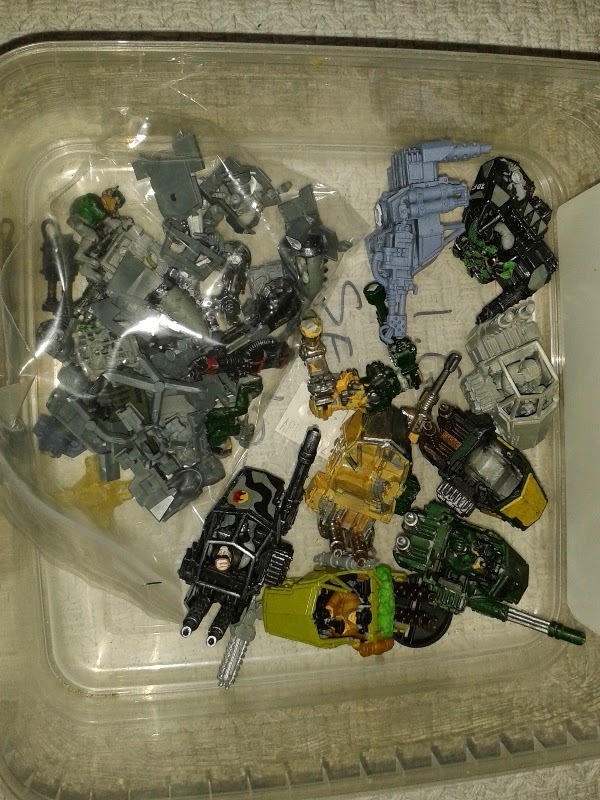 I then managed to pick up 4 Armoured Sentinels in top condition for a small amount of cash - can't remember how much. I wanted more armoured Sentinels, though, so I hit the bitz shops and picked up some of the plated canopies and some feet and legs to make up what I was missing. Right - out comes the drill, wire and glue. Chocks away! 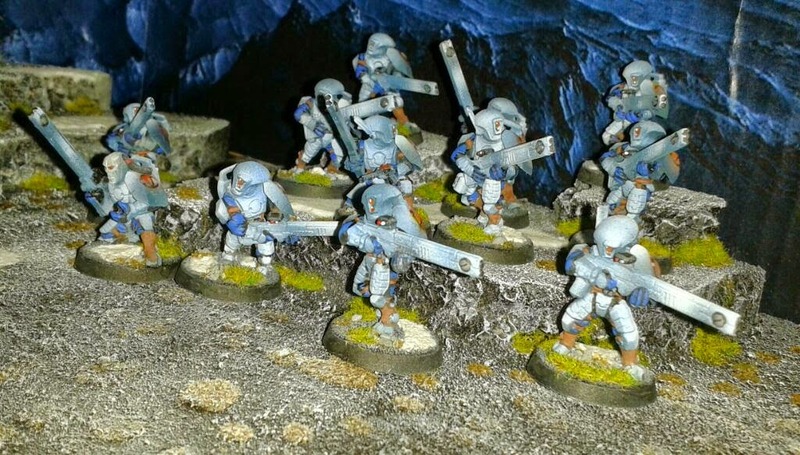 Here is my third and (for a short time) final post in this series on preparing my Tau army. There will be more on this project in a few weeks but I want to do a short side project as a break. So, here is my third unit of Fire Warriors.